Well Attended Mass in Howden. The Mass celebrated last night at the church of the Sacred Heart in Howden was well attended. I did not get a chance to count, but going bey the number of booklets used, the congregation was around 35. Fr David Smith of St Marie's Church in Hallifax celebrated and the propers were sung by the Rudgate Singers. 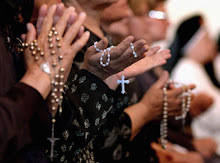 The congregation joined in Missa de Angelis. I was well pleased by the size of the congregation. I had guessed that about 20 would come. The fantastic news is on the BBC here. Starting on Sunday 11th October, there will be a regular weekly Sunday Mass in the usus antiquior at the Church of the English Martyrs, Dalton Terrace in York. It will be at 6.30pm, not 6pm as previously. For the time being, it will be a Low Mass. The celebrant will be Fr Stephen Maughan. The Sunday Latin Mass in York that was suspended last January is to resume. The target date is Sunday 11th October, although we cannot be sure of this at the moment. Neither can we be sure of the timing or venue. 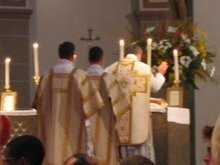 What we do know is that for the time being, it will be a Low Mass. The celebrant will be Fr Stephen Maughan, who has had to learn the ars celebrandi of the usus antiquior, and readers will understand that we cannot proceed until he has satisfied himself that he is proficient. Full details will be posted here as soon as they are available. There will be a Mass in the usus antiquior at the Church of the Sacred Heart, Knedlington Road, Howden at 7.30pm on Tuesday 29th September, which is the Feast of St Michael the Archangel. Fr David Smith of St Marie's, Halifax will be the celebrant. It is proposed that it should be a Missa Cantata, and in view of the the feast, Missa de Angelis is appropriate. Of course, this is only practical if enough people turn up to sing. The church is very close to the M62 motorway so is easy to get to. Leave the M62 at junction 37. When you reach a roundabout, turn left; and, after 100 yards, just before a pertol station take a very minor road on your right. At the next junction, turn right, follow this road around a curve. You will find the church on your left just before you reach a crossroads junction.